I had a couple of loppers to cut the branches off the fig tree every year in August when the figs have turned to mush and are dropping off the tree faster than they can be picked. Can’t find any of them at the moment. Did have some yard guys working on landscaping a couple months ago, so perhaps the loppers are off lopping somewhere else. I don’t even want to admit how many hand pruners I had lying around the yard – rusting because I forget where I leave them. I can’t seem to find but one of them at the moment. And my large slip-joint pliers have gone missing. But screwdrivers! I have a million of them. Of course, when you need the phillips head screwdriver, all you can find are flat head. What does this have to do with the price of eggs? Or with voiceover work? Wait – I’m thinking. I’m thinking. Come to think of it, I also have a lot of mics – Two matching AKG 3000s, an AKG 1000, 2 matching ADK Hamburgs and an EV RE20. Not very expensive mics, but mics that I tried and liked. And then found something else I liked better that was still inside my $ threshold of pain. And just the other day, I was down at the audio store where I found most of my mics looking at yet another one because they are/were going out of business and had some good deals. I guess it says something about how I approach my life and work. I’m curious to know how things work. I have a lot of interests. I make quick decisions – sometimes. (Sometimes I never make a decision.) I like to be in control. I’m a perfectionist, yet sometimes a random perfectionist. I am never nervous – when I am prepared. Scared silly – when I am not. And I’m thrifty – sort of. When you end up with multiple “bargain” items that don’t necessarily function the way they were intended (or as they did at some point in time), thrifty turns into a waste of time and money. But when they do work, it means redundancy. Back in 1996, I hand-coded my first website – before WYSIWYG interfaces were invented. I wanted to know how to do it. And the cost to have someone create a website was high because it was new, so I balked at forking over the cash and figured it out for myself. This was a good thing. I still retain basic html knowledge and can go in and fix balky WYSIWYG interfaces. I am a frequent beta-tester of software and websites. The control and curiosity part of me surfaces here. This started back in the days of CP/M, DOS and dot prompt computers that simply didn’t do what I wanted them to do. As a video scriptwriter at the time, I wanted to write two-column scripts and keep the left and right sides lined up. I sure knew what I wanted to do, but technology simply hadn’t caught up. And this desire hasn’t changed. We always want our toys to do more than they do. Actually, I think I have reached the limit on what I want my TV remote to do (and I’m getting close with the phone too!). How does all this affect my work? When it comes to the actual recording part of my job, my curiosity and perfectionism come into play. No matter the script, I can find something interesting to connect with. Even when reading endless lists of the names addresses and phone numbers of dentists, eye doctors and lawyers, I find a way to keep it fresh. Guessing how many more listings in AZ before it moves into CA. Trying to read the next prompt while I am finishing the current prompt without making a mistake. Here is where my thrifty side shows its face. I spend a lot of time trying to find the least expensive solution. And because I am so connected on the internet, I have been able to find some truly great bargains over the years on technology that has improved my bottom line. Finding a used Musicam Prima through the precursor to the VO-BB for example. The upside to this is that I usually have backup when things get goofy. Because of my interest in all things software or Internet related, I have been on the first wave as a Beta Tester. This has been helpful in getting software that actually helps streamline and improve my workflow. It has been helpful in reducing subscription costs to several casting websites. My random perfectionism rears its head in this department. My marketing efforts in the past were much more organized and now – not so much. But it is always somewhere in the forefront of my mind. And far far away from sales – which is another subject entirely and not something I like to do. A popular saying within my particular voiceover community is that “there is no math in voiceovers.” Well, that turns out not to be true. There is a lot of math. Quoting rates for example. Every project is different. There is no one size fits all here. So a standard rate card is difficult to establish. I have it on my list of things to do – at least something that is close. But no, every time someone comes to me directly, it takes time to come up with a rate. And everyone wants the quote figured in a different way, so even with a “rate” card, it has the ultimately be converted from cost per finished minute to cost per word to cost per project. Keeping track of hours. Creating invoices. Depositing checks and or balancing the accounts. Taxes. Collections. All of this involves math. I muddle through. I have managed to cobble together a successful business – at times highly organized – other times – not so much. In going through the papers of first my aunt, then my father and now my mother, I see that I am not nearly as organized as I should be. But it seems to be working. One of the lawn mowers made it’s way out to the alley last week and was adopted by an alley elf…so now I only have two lawn mowers. The electric mower is slowing being disassembled using one of my many many screwdrivers and the remaining pair of pliers and will be discretely disposed of in the trash over the next couple of weeks – leaving me with one mower – that works – sort of. I just saw a blog post from my virtual voiceover friend and prolific blogger,Derek Chappell that made me laugh out loud. Just what kinds of situations do REAL working voiceover talent face as they go about the business of recording a script? Interrup…what the h#%@! was that? Distrac…oooh, look at that! Today, I am not talking about being distracted by amusing kitty videos on Facebook, although I did see at least one funny video that distracted me so far today. And I’m not talking about the constant flow of email that comes in that – of course – needs to be handled immediately (even if it DOESN’T). Nor am I talking about being interrupted by the dog scratching at the door, or the cat sliding across some papers which are now all over the floor and need to be picked up before the dog actually gets in to trample them with dirty paws. And I am not talking about the frequent helicopter flyovers – both routine (the gas’em up path is over my house) and not-so-routine (the circling helo’s looking for whatever mischief is being sparked by semi-high density housing and a bad economy). No today it is interruptions of major proportions – but an interruption with a shining light at the end the alley. Today, the back hoes and diggers are punching through the patched concrete in preparation for laying new concrete and getting the heck OUT of my alley where rotating crews of gas company and water department and contractors have been grinding and digging and filling and repeating for the past three (yes 3!) years. Some distractions we can stop. I don’t HAVE to have my Facebook page open all the time. Or my Skype account. I don’t HAVE to check email constantly. 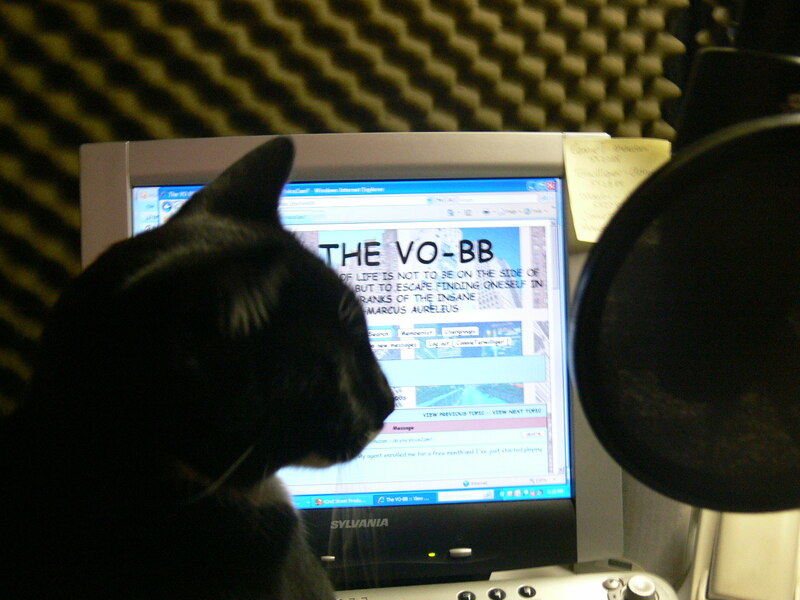 Or see what is happening with my peeps on the VO-BB (wait, I do have to do that). Some interruptions can be reduced. I can turn the ringer off on my phone (a possible problem in that I would likely forget to turn it back up). I can keep the door closed to the cats and train the dog not to scratch. There is plenty of paperwork to do during those time when I can’t actually record. In fact, I just went through my In Box sorting and filing and found a couple of little things that almost fell through the cracks. And, of course, there is a great big outdoors that would love to spend more time with me. Interruptions and distractions are a fact of life. But it will be so nice when this work in the alley is finally completed. Does This Mic Make Me Sound Fat? There is no one size fits all when it comes to microphones. No one price range that will guarantee that a mic will sound wonderful with your voice. It all “depends.” It depends on your own particular physical characteristics. It depends on the room that you are recording in. But it is always SUCH a huge topic of discussion with passionate opinions on what mics are BEST. It gets as bad as the PC vs. MAC debate. But it is still interesting to listen to the differences (or lack thereof) between the various mics and their price points – and that is why I am forwarding these links. Poke around on the net and you can probably find more mic shootouts. I am pretty sure there was another comprehensive blind shootout, but I must not be using the right key words. If you know of others, please post a comment and the link. My eyes crossed as I tried to figure out what the problem might be. I checked the sketch the engineer left me the last time he was here. But with the client on the line, my stress level was such that I was not going to figure it out. We agreed on a short break to see if I could reach him my engineer. If I couldn’t figure it out, we would use a work around, which is not my preferred way of working. A couple minutes later, after a quick phone call, everything was working correctly – my client called back in and our session went great from that point. So, what happened? Cats is what happened. Try as I might, I simply cannot banish the critters from my studio entirely. So at some point, in the process of trying to crawl behind the equipment cabinet to a nice warm spot, my little Lista must have depressed a couple of mute buttons. While I can record broadcast quality sound in my home studio, I do so miss the days of going to someone else’s studio and letting them worry over the technical issues. An engineer can see those depressed mute buttons with his eyes closed. And while I want to THINK that I will remember to check the mute buttons, the next time something like this happens, I can’t say for certain that I will. That’s why I keep the phone number for Pro Sound and Music handy.